CONGRATULATIONS to Glyn Smith for taking the third position overall in the Ryston Grand Prix Series 2012-13 in the MV60 category. In order to be eligible for this Glyn had to complete one of each of the three distances: 5, 9 & 6.5K. That's in addition to his regular support for both the Essex and Frostbite Friendly Leagues. An inspiration to us all for 2013-14. All individual results for all races, including the Inter- Counties and English Schools, have finally been posted. Scroll down for last seasons results and see the improvement in turnout and performance. Runners wanted for the National Road Relays, which will take place in Sutton Park, Birmingham on Saturday 13 April 2013. We are eligible to send one men and one women team. Men's have 12 legs (6×8k and 6×5k) and the ladies have 6×5k. The deadline for the registration is 3rd April, so a quick response would be much appreciated! Don't miss the chance to participate in this great event where you can meet with the Nations bests! The race report and results from the final race of the series can be found here. The overall results for the series will be posted as soon as practicable. Well done to all those who completed the series. The track is open on Tuesday 2nd April (Tuesday after Easter) but we have no coaching sessions planned for road running. Some (maybe all) of the usual coaches are away so please do your own thing. Take care! Apologies for the lack of auto-updates. It's actually not my fault, it's theirs! I access the results via the event history page, you see, and today's link gives no data. Monitoring the situation. Latest: results now up. Check the Stowmarket Striders homepage http://www.stowmarketstriders.org.uk/ tomorrow morning to see if the Stowmarket Half Marathon 24th March is going ahead. It says, 'Race update: We have spent the afternoon at race headquarters preparing for the race to go ahead tomorrow. A final decision can not be made until tomorrow morning. Please check back here tomorrow.' There isn't a current update on the dedicated half marathon website. Fingers crossed! In case you have not heard, tomorrow's Oakley 20 has been cancelled. ..is it really that time already? Yes, this Tuesday is last Tuesday in the month and that means the clubhouse is open after training for drinks,snacks, general chat, and pre-marathon 'swag'. OK, the 'swag' is optional.Club Night! and last club night before the Easter break at that, so do look in! • Lady runner needed for this Sunday's Road Relay team! The race report and results from the British Masters Championship can be found here. The full results for the Inter-counties and English Schools Championship will be posted as soon as practicable. The 2012-13 cross country season is drawing to a close. If you missed out there's still one last opportunity to get all muddied up at Ryston GP on Sunday. You won't be disappointed with the one loop of 6.5K in the forest at Shouldham Warren. I'm not sure whether our John Baslington found his trio of ladies (perhaps he should ask Glyn for tips? ), but his time at the Fleet Half was pretty smooth; 49th place out of 2286 in 1:19 flat. Elsewhere, Andrew Unsworth's second Half in consecutive weekends at Colchester earned him a handy 1:47. Good stuff, guys. Congratulations to C&C superstar Katie Sherwood on her PB, 3rd female and 1st V35 at the Ashby 20 in a stunning time of 2:15. I was quite a long way behind unsurprisingly, but 2:27 was a new PB for me too. Conditions were shocking, with freezing rain, sleet and snow to contend with, but I suppose it's a good incentive to keep running quickly as to slow down would result in hypothermia! I've been organising a team for the Fleet Half Marathon THIS SUNDAY and have had three female places drop out. So if anyone is struggling to fill their weekend the girls are willing to hand over their chips for a small price of the £20 entry fee. We all know that Cambridge is a running town. There's some kind of education sector, and I think also some root vegetable production, but it's essentially a running town. So it can't have surprised anyone that Sunday's second annual Cambridge Half Marathon was rather a spectacular day out. The ancient city centre was given over to brightly-clothed, brightly-faced runners in a magnitude that would have provoked both annoyance and envy amongst the begowned. Absolutely everyone ran, or marshalled, or organised, or supported. Weather conditions will also have surprised no-one who has experienced the bitter edge of the Siberian winds that whip across our open spaces. But once you've donned your thermal undershirt, wind jacket and Ranulph Fiennes-brand mittens, it wasn't a bad day for quick times. Fastest of all was the sponsors' champion, Jon Pepper from Brighton Phoenix, in an impossible 1:06:14. But astonishingly close behind were our own Duncan Coombs, who was fifth overall in 1:12½, sixth-placed Stephen Watterson (1:13) and top-ten Charlie Wartnaby (1:14) at a speed which will have sunk the wind-chill factor by a few degrees. Well done guys. Also in the incredible category, not far behind female winner Lorna Russell of Winchester's 1:15, were our own elite ladies; Melanie Staley, sixth in 1:26, Caz Pritchard (1:28, ninth), Sarah Wightman (1:29, tenth) and Nicola McBride (1:29, twelfth - click "read more" for Nicola's tale). Outstanding. Congratulations too to Diane Potter for winning the V50s in 1:37. Charlie, John and (hopefully) a team of willing volunteers are sorting out the huge database of results, but there were hundreds of C&C stories of mostly triumph, occasionally disaster; many such tales were told in the pub after (never seen so many C&Cers cradling hot drinks in a licensed hostelry). Huge thanks to all who put it on - a great day on many levels, and a proud day for all Cantabridgians. Check out the gallery for Beth Jones's action pics, and please do upload your own. "I wanted thank the two 1.30 pacers for their superb support during the last 1.5 miles of the Cambridge half. Having thoroughly enjoyed the first 11 or so miles, halfway through mile 12 I developed severe cramp in both my calf muscles. Just as I began to think I would lose it all in the final stretch, two pacers appeared by my side like military medics on a battlefield. ‘Come on C&C!’ they shouted in unison. ‘Stick with us, don’t lose it now.’ Despite my grunts of pain and protest, they refused to let me drop behind and shouted encouragement and tips as we ran along (including ‘if the pain is that bad, shut your eyes,’ which amused me as I negotiated the twists, turns and uneven duckboards on Midsummer Common). They were charming, generous and faultless pacers. I know I wouldn’t have done it without them – my final time 1.29.59. Thank you gentlemen." The women's group is going to have a gentle out and back tonight. Any gender can come along and join us! Perfect half marathon recovery run. 20 minutes out and the 20 minutes back, you'll need to bring a watch. The finish positions of all those who represented the county at Cofton Park, Birmingham can be found here. Full results for each age group will be posted as soon as practicable. In case you didn't hear, our Social Sec Liz has planned a 'recovery' session after the Cambridge Half, at the Old Spring pub, 1 Ferry Path (off Chesterton Road near Mitcham's Corner) from noon. See you there for a beer and some grub. Team results appeared today for the final Frostbite, leaving us 4th overall for the season out of 16 senior teams -- respectable if not up to initial high hopes -- and 12th/15 for the juniors, which doesn't hint at some of the outstanding individual performances clocked by the girls this time (Diana, Amy, Kathryn in 1st, 3rd, 14th, well done!) and previously. Thanks to Rich for looking after us. Hi all! The South of England Road Relays take place on Sunday 24 March (men's race at 12 noon and women's 1pm) at Stantonbury, Milton Keynes this year. At the moment we are a couple of runners short to register two teams each for the men's and the ladies race, so please e-mail me to istvan.jacso@hotmail.com if you are interested! The club will pay your entry. I have added in the results for The Cambridge Boundary Run. If you spot any mistakes, please feel free to correct them or add those I have missed off. The run (half and full marathon) is a popular early season marathon organized by Cambridge University students (The Hare and Hounds). The event was heavily over subscribed this year. It was excellently managed and marked this year and with the fine weather it was a real pleasure to run. I ran with my nephew and we eventually made it around despite a slight fuelling crisis in the latter stages....The stiles and kissing gates were particularly challenging. 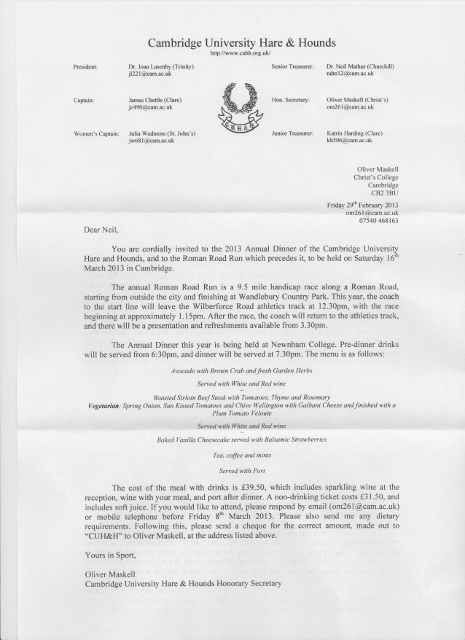 We've been invited to run in the Roman Road Race by Cambridge University Hare and Hounds (their cross-country club). It's an excellent traditional event along the Gogs, for just over nine miles, and is run as a handicap - slowest off first. Well worth having a go if you can. Details are in the attachment. It was a pretty good day for the first Swavesey Half since the Olden Days. This incarnation is run by the excellent Swavesey Village College, and with local knowledge of every inch of the route through Swavesey, Fen Drayton and Fenstanton, I had high hopes of pipping C&C legend Mike Salt to the title. Once Salty had been mis-directed towards the A14 to chase the five-mile race, things looked good, but despite the lengthy detour he hung on to pip me by 26 minutes and his closest rival by a couple in 1:18. Rather awesome, I'd say. Kye Liddle was in the elite pack too, taking an excellent fourth place in 1:21. Eerily, our girls mirrored the chaps' placings, with Katie Samuelson (1:32) taking a glorious and untroubled win, with Carmel McEniery (1:44) fourth. Congratulations all. Darren Gillman was in fine form too, clocking 1:36, with Glyn Smith (1:47), Liz O'Donovan (1:50, tenth female), Gianluca Savini (1:56) and Diana Braverman (2:00) all doing us proud. The five-miler was rather productive for C&C too, Melissa Dix taking third place and Charlotte Tame sixth. Well done both.